1145 at Bewdley, November 2009. Photo: Mike Cranmore. Churchward passenger brake. Built in 1922. Purchased in 1973 from Bristol. 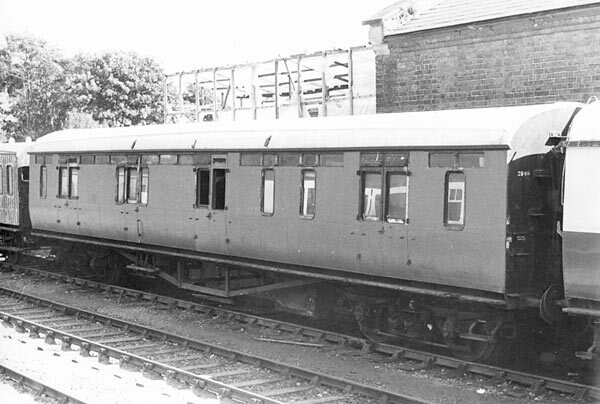 These vans were built for carrying parcels and similar goods and also for use on milk trains. It has been used on the Valley as a grotto for Santa and is now used as the Association's shop at the Bewdley. In a joint project with the LNER (SVR) Coach Fund basic conservation & restoration work was carried out between 2007 and 2009 to provide sound accomodation for the Fund's shop at Bewdley. This releaseed the Fund's Pigeon van 70759 from its shop duties for restoration. 1145 has now swapped roles with our Milk Brake 1399 and is now in use as Association's shop.